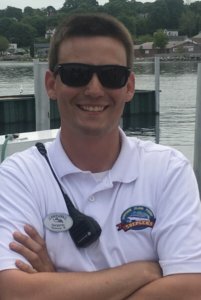 Cast Member Spotlight – Benjamin W.
Our second installment of Cast Member Spotlight to highlight the great people we have working for Shepler’s Mackinac Island Ferry. About Ben: Ben is 20 years old and attends Western Michigan University, studying chemical engineering. In his free time, Ben enjoys playing guitar, drums, tuba, and piano. He also loves to travel. Some of his adventures include spending the summer in Alaska and California. Favorite part of working at Shepler’s: Ben’s favorite part of working at Shepler’s is being able to interact with the guests and make their transportation to Mackinac Island a memorable and enjoyable experience. Also, he loves to work on the ferry boats, spending his days on Lake Huron traveling back and forth from St. Ignace to the island. According to Ben, the view that one sees from the boat is extraordinary and never gets old. Each day he comes to work looking forward to meeting new people that are traveling to Mackinac Island. And, being able to work outside in the beautiful city of St. Ignace is a definite plus. Ben’s Shepler’s Story: Ben will always say the best part of his day is when he can make someone smile. One time when he was working on one of the boats, a woman came up to him and explained that it was her son’s birthday. Ben took this information to Captain Steve and they made an announcement wishing the young boy “Happy Birthday.” Upon hearing his name over the speakers, the little boy was filled with joy. Ben said it was wonderful to watch because he could tell that the boy’s day was made. Being able to make a person’s day special is always a fun opportunity for our workers and this is Ben’s favorite story to tell about working here. At Shepler’s we always do our best to ensure our guests have the most memorable and enjoyable experience on their trip to Mackinac Island.